High School students from Flintridge Sacred Heart Academy joined together to have a session about the Sustainable Development Goals and set up a hub at the Cottonwood Festival in Flintridge, in which they aimed to raise awareness about the Global Goals. They managed to spread the knowledge through the session and eventually filled in several MyWorld2030 surveys. Most of the participants were new to the global goals. They found out SDGs are of crucial importance in their everyday lives, to the point that when filling the survey they could not even choose 6 out of 17 because they all mattered to them. The hub was focusing on SDG13 Climate Action, which was the most related to the course the students are currently undertaking. They created pins of the SDGs by recycling plastic bottles caps, showing their engagement in climate action. Students from the Flintridge Sacred Heart Academy marking the recycled bottle caps with SDG numbers from 1-17. One of the participants after visiting the student-made hub at the Festival. There has been a lot of curiosity around the SDGs, people felt the need to know more, asked for further information and eventually engaged towards their achievement and evaluation through the MYWorld2030 survey. A visitor filling out the “My World 2030” survey after listening to the student’s introduction about the SDGs at the festival. In 2015, 11 year-old Sumaya Murabit noticed that there was very little awareness about the Sustainable Development Goals in her local community in Saskatoon, Canada which made it difficult to actually mobilize others into action. After getting her family’s support, Sumaya approached her school teacher, principal and the Saskatoon Public School Board to tell them about the Goals and her idea for a “Poster Challenge” where students designed posters based on the goals. Sumaya also emailed the City Mayor, University Professor Keith Walker and well known radio personality David Kirton. She recruited them onto the “judging panel” and by creating more collaboration with other sectors was able to ensure greater public and media awareness. In the first year, three classes participated in the poster challenge. Now in its second year, students from three grades in 14 schools – a total of 42 classes – in the city cake together at Roland Michener School Saskatoon where the final posters were viewed and the winner and finalists were announced. Saskatoon Mayor Charlie Clark spoke to students about the importance of local leadership and taking action, Chief of Staff Michelle Beveridge spoke about women’s leadership, Saskatoon Public Schools Director Barry MacDougall spoke about how an idea – with action – can transform the world, indigenous rights activist Andrea Ledding spoke about her work advocated for murdered and missing aboriginal women and the necessity to start now (even if that means starting small). Whitney Graves from Rock 102 told everyone to just “do whatever they put their mind to (unless it’s illegal)”. The students each spoke about their posters, which Global Goal meant the most to them and what they felt needed to be done to actually achieve them. The winner of the poster challenge was 13 year old Jordyn Guan whose poster focused on “Quality Education”. Jeff Shepherd, principal of Roland Michener School is incredibly excited to see the challenge continue to grow over the next 13 years, anticipating that next year at least 24 schools city wide will be involved. He encouraged all students with ideas, telling them that while it may seem small, it can impact so many and turn into something great. All 17 finalist posters have been framed to be showcased by the Saskatoon Public School District and City of Saskatoon. Bridges of Understanding is a 501(c)3 not-for-profit, nonpolitical organization established in 2007 to enhance positive relations between the United States and Arab World through one-to-one connections between thought leaders and the creation of original youth focused programs. The Campaign has had a partnership with Bridges of Understanding since June 2016 to promote empathy and understanding around the refugee crisis, co-develop educational and new media activities and to increase awareness and action around the SDGs. The Campaign organized a We the Peoples hub during the annual Gala. The SDGs were on display, featured as a selfie tool at the step and repeat photowall. Guests also had the opportunity to watch Clouds Over Sidra & My Mother’s Wing on virtual reality headsets. The gala honored Arianna Huffington and Chaker Ghazaal for their contribution to promoting global citizenship, connecting people, countries and cultures. YouTube Change Ambassador, Ingrid Nilsen joined a panel at the 2016 Social Good Summit entitled “LGBTQ in the Media: Shaping the Global Equality Narrative.” The panelists, which also included fellow activists Jazz Jennings, Tiq Millan, Sarah Kate Ellis (President and CEO of GLAAD) , highlighted the importance of having LGBTQIA people and issues represented in the media, discussing what it means to be accepted and to empower people around the world who may not be able to see themselves otherwise represented. They noted the absence of such representation in media during their own youth, noting that seeing similar representatives helps to reinforce identity, especially for children and young people who feel alone in the world without it. Ms. Nilsen celebrated the fact that stereotypes are being “obliterated.” She commented how being a public figure and YouTube Creator means her identity is constantly challenged. She recognized her role in empowering others and breaking stereotypes. She thanked those who have laid the “foundation” before her, “planting seeds in a garden we may never see… seeds that were planted a generation before me, and I want to build upon that”. Academia and the most marginalized groups are two crucial stakeholders for implementing the 2030 Agenda and the Sustainable Development Goals (SDGs). But how can the two be connected and collaborate on achieving the SDGs? On March 28th, during the Annual Community Day of Columbia University School of Social Work (CUSSW), the UN SDG Action Campaign came to Morningside Heights and found the answer by meeting with great minds from the social work profession, who are dedicated to reducing poverty and changing lives. Alice Chen from the Campaign carried out in-depth discussions with faculty members of CUSSW on how to bring SDGs to the most marginalized groups. Professors shared their groundbreaking intervention research on poverty, health, refugee, immigrants, and many other topics that are directly linked to the SDGs. Alice introduced our innovative works on using big data and new technology to include people’s voices in the SDGs implementation, which excited our audiences. The CUSSW Community Day is an annual event organized by a coalition of student caucuses at the school. This year over 50 workshops on cultural topics were held for students, faculty, staff and community members to explore cultural diversity and cultural competence. 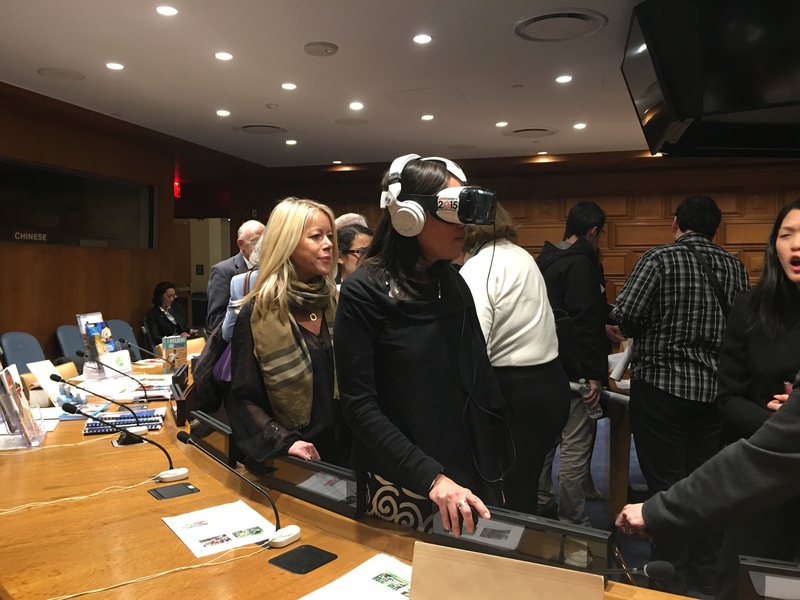 The UN SDG Action Campaign brought our VR films “Clouds over Sidra” and “Waves of Grace” to the audience in the cultural showcase session. 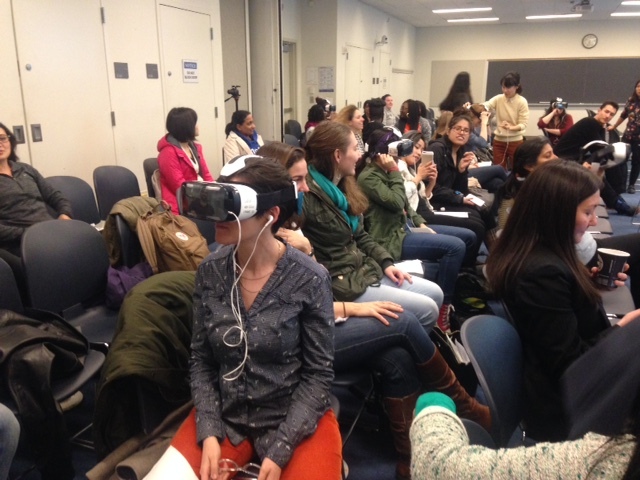 Participants were transported to the Za’atari Refugee Camp in Jordan or the streets of Liberia by way of VR goggles. Many students experienced this new technology for the very first time and they were profoundly moved by both the story and the way the story is told. Gulnara Zhakupova, a second year Master student of CUSSW, said that “Clouds over Sidra” prepared her better for her future works with the refugee population. 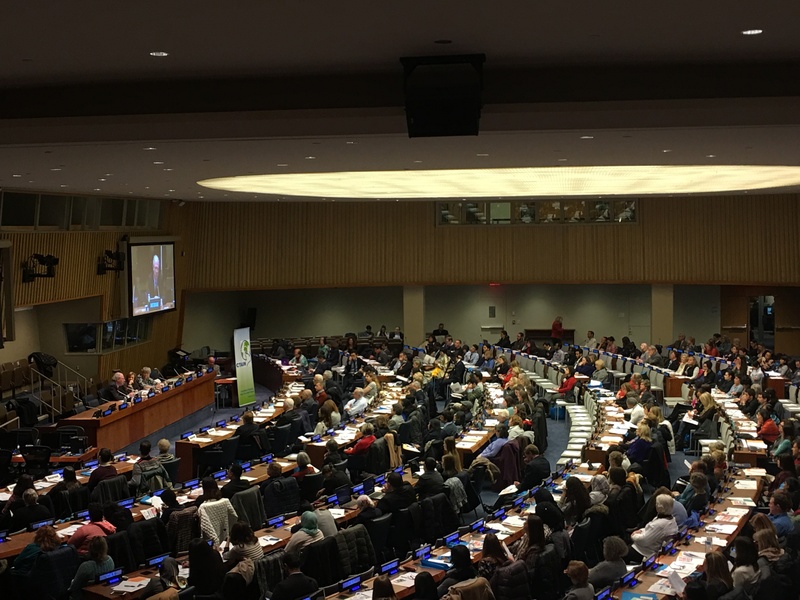 On January 22nd, over 500 educators and students from around the world participated in the Committee on Teaching About the United Nations (CTAUN) 2016 annual conference to learn more about the Sustainable Development Goals (SDGs). The SDG Action Campaign was invited to showcase Humans of MY World data and stories, the World We Want platform, and the UNVR series. In September 2015, delegates from 190 countries met at the UN headquarters in New York to agree on the new Sustainable Development Goals (SDGs) and 169 targets to guide global development over the 15 years. The SDGs are the most inclusive and transparent goals for the world ever because the consultation process was truly human-centered: 10 million people all over the world have voted for their most passionate goals through the MY World 2015 Global Survey. 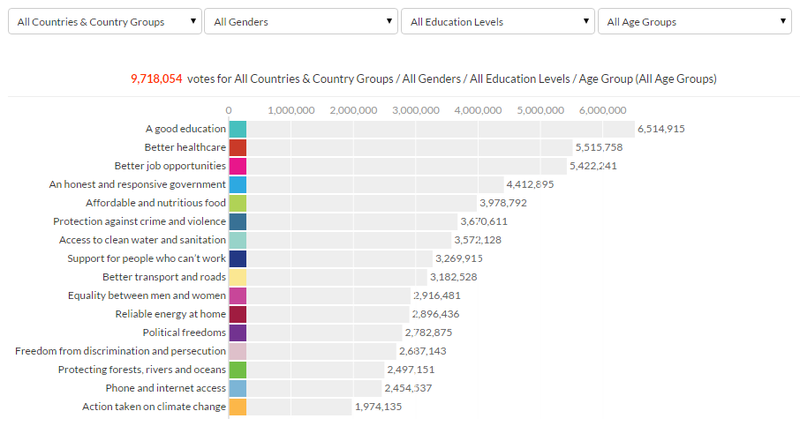 In this world’s largest survey, “A Good Education” has been identified as the most popular priority among voters across region, gender, and age (See data: http://data.myworld2015.org/). With that said, worldwide educators and administrator are key partners of the SDGs. Ruth later shared with the SDG Action Campaign that we “certainly had the most innovative displays” – thanks Ruth! The SDG Action Campaign also showcased the well-known Virtual Reality films “Clouds Over Sidra” and “Waves of Grace” to the InfoFair. The strong emotions that brought by the films as well as the cutting edge VR technology enhanced people’s understanding of the most marginalized groups. 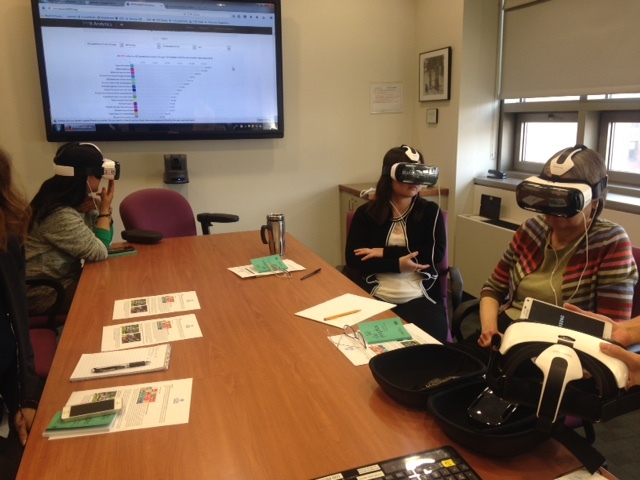 Teachers and professors were eager to use this powerful empathy tool in their future class of SDGs; Students were inspired to organize VR screening events on campus to bring awareness of SDGs among youth. 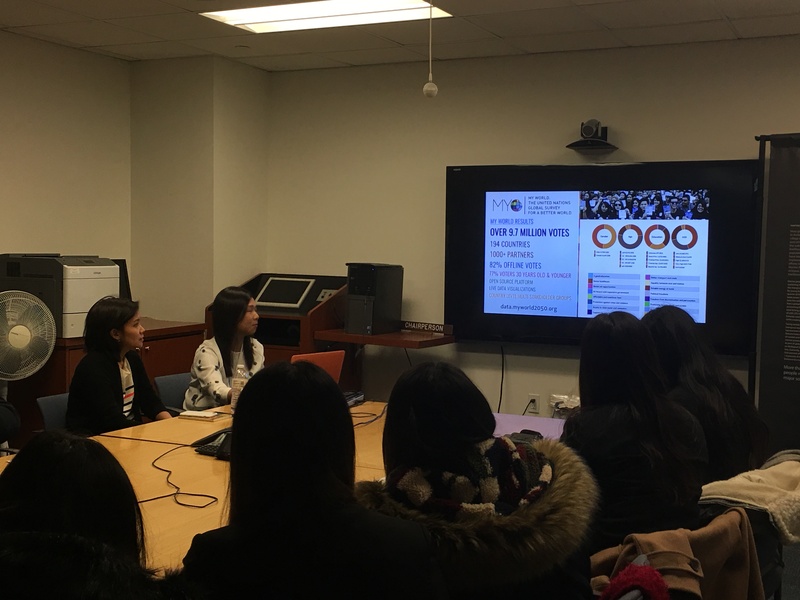 On the same day of CTAUN 2016, we welcomed a group of young delegates from University of International Business and Economics of China discussing SDGs and education with the Campaign. Tim Scott, policy advisor on Environment of UNDP, and Antje Watermann from UNDP Regional Bureau for Asia and the Pacific kindly joined the meeting and introduced the 17 global goals as well as the implementation process in China to the young delegates. The audiences were passionate about the MY World 2030 survey and highly interested in the innovative waste project initiated by UNDP China and Baidu. Alice Chen presents results of MY World 2015 survey and introduces MY World 2030 to young delegates from China. In 2016 when the SDGs officially came into force, there really has been no better time than now for global educators to think deeply about how to take actions and to inspire the action of students, to ensure the successful implementation of the 17 goals in the next 15 years. To that end, CTAUN, which has been enthusiastically advocated for the SDGs, passionately addressed the 2030 global agenda in its 2016 annual conference with hundreds of educators and students. The all-day conference gave an explicit overview of the SDGs, discussed topics such as global food security, sustainable food production and consumption. It also addressed environment issues surrounding water, energy use and climate change. From the Campaign’s perspective, we are delighted by this opportunity to speak directly with educators in the field who are inspiring young minds on a daily basis. These young minds will one day become the leaders of tomorrow and the ones to transform the SDGs into reality over the next 15 years.